Just like your favorite “fun size” candy bar, snackable content is made for the on-the-go consumer who needs answers to his questions in a moment’s notice. When done right, snackable content leaves the consumer hungry, and eager for more. The evolution of snackable content began with Twitter. With a strong emphasis on brevity, making all 140 characters of a tweet “count” is a challenge, and an art. With the constant on-the-go culture we have adopted, we have no time to read a lengthy article. Neither do our followers! On WordPress sites alone, users produce about 42.6 million new posts and 51.6 million new comments each month. Stand out among the crowd; everyone wants to be friends with the guy with snacks. Content with images drives 94% more total views than content without. 67% of online consumers consider clear, detailed visuals to be more important than product information or even customer ratings. Visuals show your products without actually telling people about them. Giving customers the freedom to make their own assumptions about what you offer. Use lean, mean content. Cut the fluff and get to the point. Snacks, not buffets. You have ten seconds to get the attention of your visitor. The usability maestro Jakob Nielsen’s Darwinian logic is spot on for content marketers. Reuse and repurpose content! That blog can become an infographic, a quote can become a digital asset, as long as it’s still relevant. Use it! The eye naturally travels in an “F” pattern. Use your space wisely. Our last piece of advice…measure your results! Using your site’s Google Analytics, or a social media tool such as HootSuite, you can see the impact of your snackable nuggets. See what works, adjust, and repeat. Our brains are wired to be visual. Use this to your advantage and tap into our innate senses when building your next marketing campaign. Are you snacky? 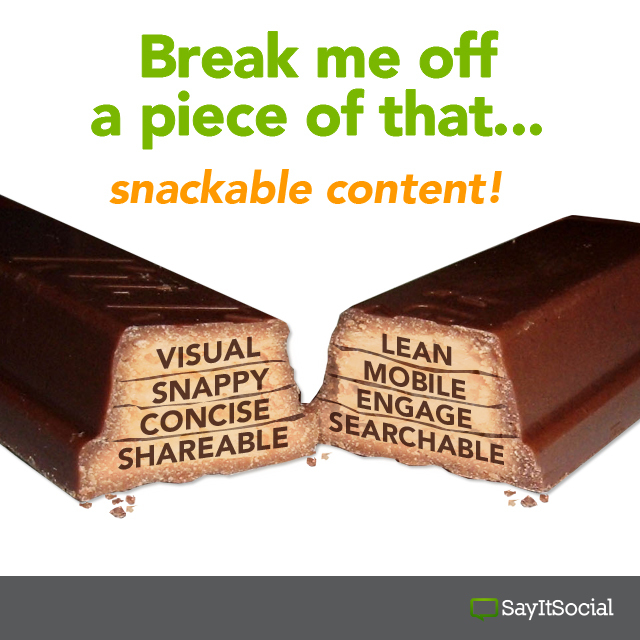 Where do you see the most snackable content around the web? Share your favorite sources in the comments below!